Real Estate Coaching Blogs List. The Best Real Estate Coaching Blogs from thousands of Real Estate Blogs using search and social metrics. Subscribe to these websites because they are actively working to educate, inspire, and empower their readers with frequent updates and high-quality information. Real Estate Coaching newsletter is a comprehensive summary of the day's most important blog posts and news articles from the best Real Estate Coaching websites on the web, and delivered to your email inbox each morning. To subscribe, simply provide us with your email address. Austin, Texas About Blog Keller Williams Realty, Inc. is the world’s largest real estate franchise by agent count, with approximately 800 offices and more than 150,000 associates across the the Americas, Europe, Africa and Asia. Facebook fans 137,632. Twitter followers 105,812. Louisville, KY About Blog Hello from Louisville, KY! Thanks for stopping by my blog. I have been investing in real estate since 1998, and I am passionate about real estate investing, and helping others become successful real estate investors. Atlanta, GA About Blog Berkshire Hathaway HomeServices Georgia Properties is one of the largest and most successful real estate organizations in the country. Led by President & CEO Dan Forsman, the company has emerged as the clear market leader for the Greater Metro Atlanta area. The company is an independently operated subsidiary of HomeServices of America, Inc., A Berkshire Hathaway Affiliate, and a franchisee of BHH Affiliates, LLC. Facebook fans 8,072. Twitter followers 969. About Blog This Real Estate Marketing website is dedicated to the real estate professional looking for direction, ideas and feedback for marketing in the real estate industry. Most people don’t realize that Realtors are responsible for their own marketing, their own marketing budgets, and really aren’t given any direction on how to succeed at marketing themselves. About Blog Join award-winning real estate coaches Tim & Julie Harris every weekday for industry news, coaching advice, and interviews with real estate leaders. Blog Talk Radio is the world’s largest online talk radio and podcast hosting platform. Facebook fans 19,710. Twitter followers 1,599. About Blog Real Estate Marketing University is an organization dedicated to helping the modern agent grow their business through advanced marketing approaches. About Blog Coaching and Consulting Lee Davenport is an experienced real estate broker and business doctoral candidate, whose passion is to train real estate agents and brokerages on how to use today's technology to work smarter in real estate. And if you are looking to transform your real estate sales game plan, be sure to get Lee's interactive workbook. Facebook fans 7,827. Twitter followers n/a. About Blog Our network shares its ideas and strategies, containing tested and proven marketing ideas, samples and strategies used by successful agents from around North America. As a member, you’ll get regular updates and access to our archives of past issues that are more valuable than real estate courses selling for $500 or more. We also share recommendations from member-agents and discount offerings on resources to help grow your business. Facebook fans 6,967. Twitter followers 14. Morris Plains, NJ About Blog Weichert Franchise offers unique real estate franchising opportunities in a system that is designed by real estate brokers for brokers. Weichert Real Estate Affiliates, Inc. is committed to teamwork, cutting edge technology and the growth of every franchise. If you are looking for a real partnership, Weichert may be the perfect fit. España About Blog We are the leading company in the coastal real estate market, both sales and rentals. We base our work on solid pillars of transparency, professionalism, honesty and customer service. When our clients choose to rely on Costa Invest they are ensured the tranquility of using a leading company in its industry, offering them exclusive attention devoted to their homes and comprehensive legal and fiscal advice. Facebook fans 5,991. Twitter followers 7,737. Cornelius, NC About Blog We are a professional mortgage and real estate coaching company that provides mentoring and coaching to mortgage lenders and real estate agents from all over the country. The CORE helps real estate agents and mortgage lenders accumulate wealth, net more income, and run more efficient teams and business. Our real estate and lender executive trainers have an average income of $1.3M and $2M in savings. Facebook fans 15,407. Twitter followers 4,772. Orange County, Ca About Blog The Boutique Real Estate Group is a boutique real estate brokerage that focuses on brilliant design, beautiful marketing & luxury services. The Boutique has created a culture that spurs collaboration, technology, and social media with a unique marketing approach.The Boutique Real Estate Group has invested heavily in bringing all aspects of the real estate experience completely in-house. This not only provides The Boutique with complete control of the design, marketing agency. Facebook fans 39,190. Twitter followers 1,913. Las Vegas, NV About Blog Real Estate Elevated is one of the nation’s leading real estate investment programs and consists of workshops, advanced camps, online resources, live mentorships, and one-on-one coaching. Facebook fans 158,377. Twitter followers 2,986. WInnipeg, MB Canada About Blog Welcome to Stefan Aarnio's blog. Here you'll discover what respect the grind means, how to get more out of life and how to maximize your investment portfolio. Discover how to raise capital to buy, fix, sell and invest in properties and how to build a multi-million dollar portfolio by reading Stefan's blog. Australia About Blog MMJ has always been driven by the desire to provide the widest range of real estate services to the industry. MMJ focuses on building long term relationships with a wide variety of clients to provide an integrated, tailored service that is effective and delivers the best possible outcomes. We attract, recruit and retain the best people in real estate. Facebook fans 1,394. Twitter followers 269. About Blog We seek the best possible results for you. We believe that tenants deserve the best possible representation for the best possible results. We work hard for you. We will fight for your tenant rights. We Are Committed to Excellent Service Building Representing Tenant RightsWe provide exceptional service. We take time to listen, to answer your questions, to return your calls promptly, and to keep you informed on the status of your case. Brisbane, Queensland About Blog Each weekday Real Estate Uncut provides professionals in the real estate industry a free short, sharp audio program they can listen to on their computers or their smart phones. Real Estate Uncut is Australia's online real estate show for real estate agents from leading industry professionals within the industry. Featuring topics like property sales, property management, social media for real estate professionals, technology systems for real estate agents, property marketing. Facebook fans 2,051. Twitter followers 13,704. About Blog The United Real Estate Group – was founded with the purpose of offering solutions to the challenges facing agents in the residential real estate brokerage industry. Providing the latest training, marketing and technology tools to both agents and brokers under a 100-percent commission strategy, United Real Estate makes it more profitable for an agent to sell real estate and for real estate brokers to leverage a complete system to better grow a successful, thriving real estate brokerage. About Blog This blog has been providing leading-edge sales and business training solutions to real estate agents and leaders at all levels since 1998. Our programs are delivered to countless customers worldwide through three primary channels products (online and offline), events and customized coaching.To deliver the highest quality real estate training and coaching services to our clients with a relentless commitment to helping them build great businesses and inspired lives. Facebook fans 15,162. Twitter followers 9,113. About Blog Breakthrough Ideas for Greater Real Estate Success! Facebook fans 6,967. Twitter followers 17. Medford, OR About Blog We are a company dedicated to helping real estate professionals upgrade their life and their business by providing coaching, tools, strategies, and systems that can be accessed and implemented from any device anywhere. Facebook fans 859. Twitter followers 81. Perth, Western Australia About Blog Naked is about being totally transparent, hiding nothing and helping people find their homes. We aren’t in the house selling business, we are in the people business. We realise that people deal with people and not agencies and that is why the Naked system is so good for our clients and our agents. Facebook fans 1,465. Twitter followers 334. Greeley Colorado About Blog It is a blog I started to chronicle my investing. I own 16 rentals, flip 10 to 15 homes a year, have a real estate sales team of 10 and love cars. I discuss my rentals in detail, how to flip, how to find great deals, how to become a successful agent and much more. I also have a weekly podcast. Invest Four More focuses on long-term rentals, fix and flipping, becoming a real estate agent and more. Facebook fans 63,316. Twitter followers 23,876. Brisbane Australia About Blog John Highman is a leading Commercial Real Estate Coach, International Conference Speaker, and Author. As an experienced Commercial Property Agent in the industry he has helped thousands of commercial property agents and salespeople globally to promote and grow their market share and commissions. About Blog Browse through Toronto real estate with the leading central Toronto real estate brokerage. Sage Real Estate is dedicated to bringing you the latest, most helpful information about Toronto houses for sale. Choose from one of Sage Real Estate's experienced agents to help educate you about Toronto homes for sale. Facebook fans 1,532. Twitter followers n/a. Carlisle, PA About Blog If you are looking to buy or sell a home, get all the information and the latest updates, tips, and tricks from The Dave Hooke Team LLC - your professional Central PA Real Estate Agents. Facebook fans 557. Twitter followers 67. Charlotte/Lake Norman NC About Blog A Video Blog about Charlotte Real Estate; It's industry, and the people working in it. Whether you're just starting out, aspiring to begin, or been working in the field for a few years, tune in to get updates, tips, tricks and more. Facebook fans 719. Twitter followers 46. About Blog This blog is dedicated to all of you real estate professionals determined to succeed at a high level--whether you've been in the business two seconds--or twenty years. I'll help you get 'Up and Running', and, if you're a seasoned agent, the information here will help you regain your momentum and take your business to the next level. 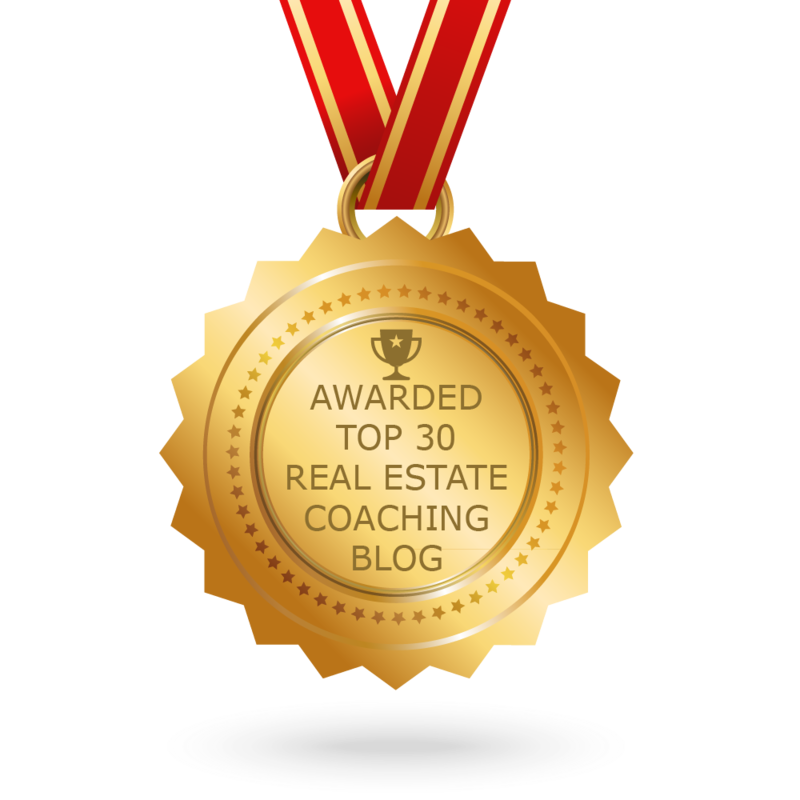 CONGRATULATIONS to every blogger that has made this Top Real Estate Coaching Blogs list! This is the most comprehensive list of best Real Estate Coaching blogs on the internet and I’m honoured to have you as part of this! I personally give you a high-five and want to thank you for your contribution to this world.